A friend of mine, Mr Luke Campion, contacted me recently and asked if I was interested in doing some texturing for a short film/vfx project he was getting started on. The models looked great and it had a narrative that builds well, so I agreed gladly. Above is the checkerboard I ended up with after unrwrapping in RoadKill. Trying to be efficient with texture seems and pixel real estate on the UV layout has a become a weirdly satisfying ritual with which any texture artist should take pride, making sure their texture is used efficiently and creates the most detail at the least cost. For example for this texture the engines and symmetrical wings are laid out identically so they share the same texture space, therefore allowing to both texture faster, and use less pixels on identical objects. I takes on a very golden appearance, a very naturalistic metal. Useful, just not the look I was going for. One of the points of reference I was given was District 9 which brings to my mind pastelly colours, matte finishes, and angular design. To get that plated look I made extensive use of the UV snapshot itself, using the lines of the wireframe to outline plates on the ship, both in the diffuse (filling them with paint and dirt) and in the bump map (to indent them properly). I went through a long stage of tweaking the maps and shader settings to get this look, making things progressively less shiny and more matte, and therefore more pleasing to look at. There's something about the glossy angularness of the wings that reminds quite strongly of the half life series and that kind of 90's shooter art direction. Its the very firm refusal of smooth edges that gives it that distinctive look. After I got some feedback from look he suggested a more "killer ipod" look, with whiter whites and blacker blacks, a more predatory "shark" look. I much prefer this white and grey colour scheme, partly because it emphasises the blue, and partly because the beige wasn't very nice. I had a lot of fun with the splodgy specular map which controls the shininess of the material, without disrupting the shape of the model you can give the impression of dirt and smears covering up its glossy undercoat. I finally decided to texture the impossible engines just by moving their UVs over existing parts of the texture that looked particularly mechanical, this worked well and made the texture even more efficient. Oh, and I added some lights, to match the blue incandescence, and because I can't help myself. This specific ship was an enemy vessel, hence the cold colours and monolithic outline. The next one was an evacuation craft and, though it wasn't specifically for medical purposes (as far as I know), I decided to give it the emergency colours of an ambulance or red cross flag. This came across more Templar knight than I intended but I love the effect regardless. I have a feeling it will go through some further revisions before the final version but I'm very happy with its current state regardless. 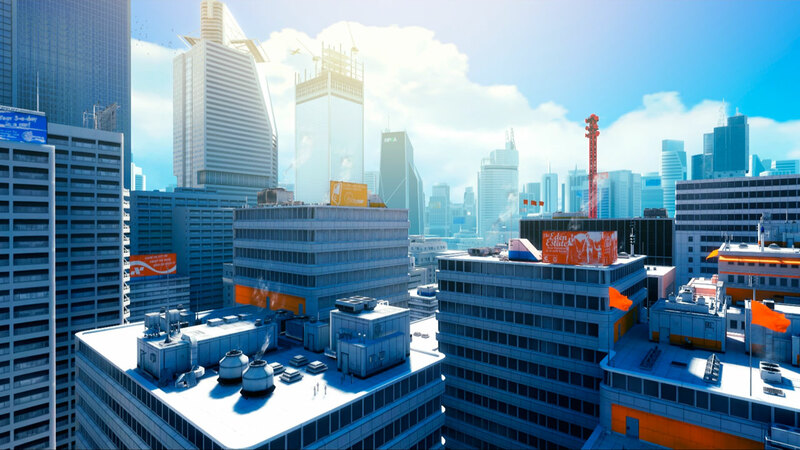 This looks very Mirrors Edge, with the bright whites, single contrasting colour, and cool blue shadows. Which is nice, but not nearly dirty enough. This ships material has a more flaky metal, construction site look. But in a noble medieval way? This ship is much more complex in its form and number of pieces, took a while to wrap my head around the UV process and most of it worked really well, but there are a couple of bits I would have done differently now. In future I will plan colour placement before unwrapping, that way if I want a strip of colour, I can unwrap that strip separately, that way avoiding awkward seams and making the base colours very easy to paint. Seeing as this is for live action ultimately I've gone as high end as possible with the textures and shaders. This one is using the mia_material, with glossy reflections and three 8k textures (diffuse/bump/specular). Its glorious. I love the way the bright light bleeds into the shadow in this render below, I think its the reflectivity doing it. I even turned on the ambient occlusion attribute the shader has built in to bring out the crevaces and it worked really well, its quite subtle and I thought I saved two renders to show the difference but it turns out I just saved the same one twice, shame, it was cool seeing the difference. Amazingly it only adds around 20 seconds to the render time and takes into account indirect lighting so it doesn't look unnatural. Mandatory. I even textured some soot inside the engine exhausts but its not as obvious as I thought it'd be. ...and called it a day. I'm really pleased with how both came out, and though they use very similar techniques they have quite distinct looks from each other, but without losing all coherence. I believe this is the first post since the year's wrap up post. I miss the structure. The people. The work. I don't miss the panic, the lack of time, but that's about it. Tom Bissell writes goooooood. Here's his take on the evolution of the Mass Effect trilogy and some of its more eccentric characteristics. E3 happened this week, and there is much I could say about it, but after watching over 12 hours of streamed conferences, demos, and news, I feel pretty numbed. There are certain unpleasant trends in the game industry at the moment which I won't give videogame pessimists the satisfaction of listing them. Suffice to say it has filled me with a powerful need to be creatively different from everything the mainstream games industry produces, and a lot of excitement for a meagre 2 or 3 games. Here is Michael Abbott's summary of one particularly boring trend, and it's relation to the rise and fall of a specific cinematic genre. Where as elsewhere, Scandinavians are making fascinating horror games from the perspective of a toddler's imagination. Praise the lord for uniqueness and diversity of creativity. Posted in "UV unwrapping", "mia_material", "photoshop", "refractive metal", "shaders", "texturing"